Back in December, like every year, my girlfriends and I had a meal at a nice Franchouillard restaurant for our pre-Christmas-madness catch-up. 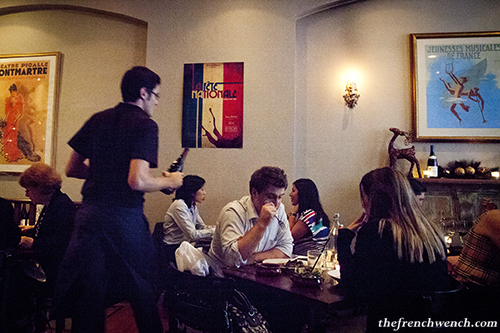 This year we decided to try Bistro Papillon, in the heart of Sydney CBD, near Wynyard Station. 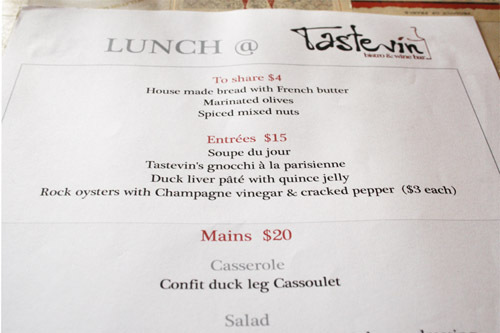 When an ex-colleague who now lives on the North Coast came back to town a few days ago for a rejuvenating plunge in the Big Smoke, he decided to invite me and another colleague for a catch-up lunch at an ol’ favourite haunt of his: Tastevin in Darlinghurst. 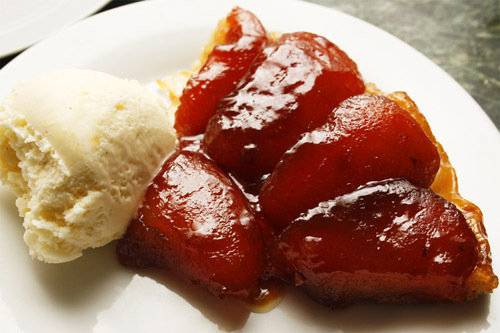 We meet on a Thursday around 12:45pm and are greeted warmly by Alex Bourdon, the Owner and Chef of Tastevin. His beautiful wife and Tastevin’s co-owner Natasha is not here today as the couple have just become new parents and she is taking care of their little girl. The place is pretty quiet when we arrive (which is fine by me, as I am not a loud talker!). Tastevin is actually better known as a popular late night spot as they serve food until the wee hours of the morning (around 2am), which is a pity considering that the lunch prices are a steal, with entrees at $15 and mains at $20! Alex runs us through the menu and I hesitate briefly between the special (Seared scallops in a cauliflower soup) and the Gnocchi à la parisienne. Last time I ate at Tastevin for a Valentine dinner, my boyfriend chose the Gnocchi and I was very jealous as they were to die for! In the end I just can’t resist and get the Gnocchi. My enthusiasm must be contagious, for the boys end up doing the same! I was very pleased and surprised to see that Bastille Day was commonly celebrated in Australia and decided to have my own little Bastille Day dinner at home this year.